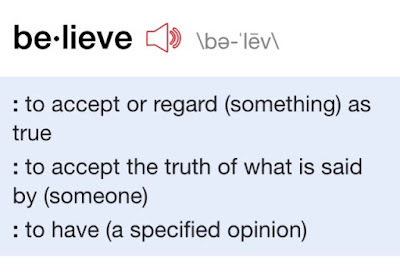 Therefore, to believe is to ACT. 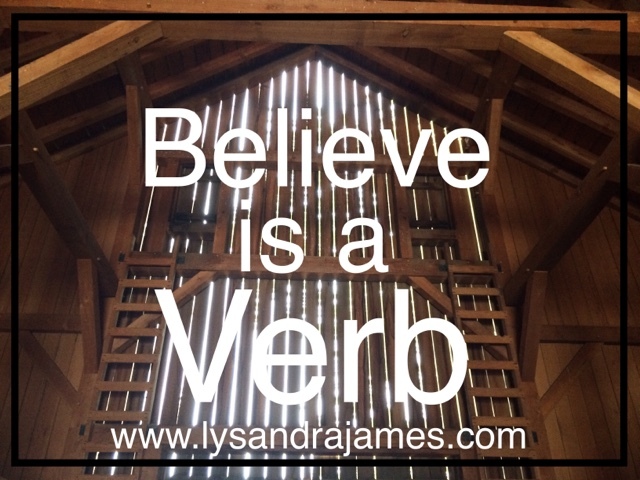 Sunday was the debut of my faith-inspired blog, "Believe is a Verb". 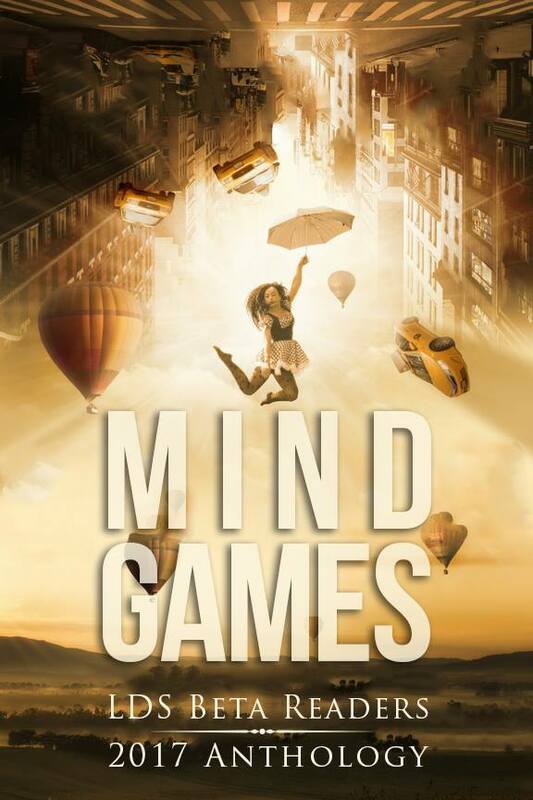 Its focus is on the spiritual side of things with an emphasis on acting upon your beliefs. And yet, believing in something or someone isn't exclusive to spiritual matters. Definition courtesy of Merriam-Webster Dictionary app for iPhone. 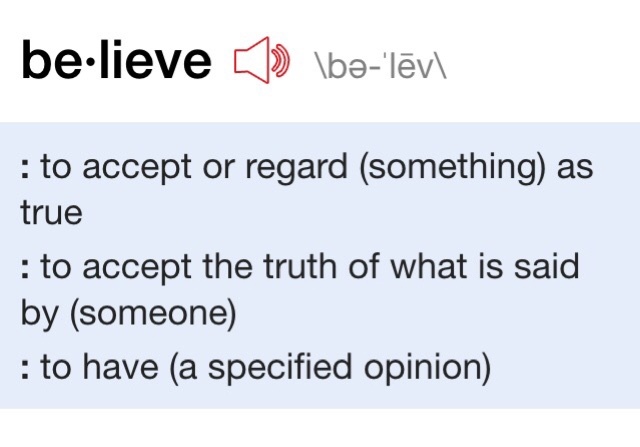 To believe is to accept something as truth; to have a firm religious faith; to have a firm conviction as to the goodness or ability of something. When you believe something, your actions are the evidence of your belief. If you believe in God, you pray and attend church. If you believe one person can make a difference, you help others whether you receive recognition or not. If you believe in your personal potential, you seek to improve your skills and talents. 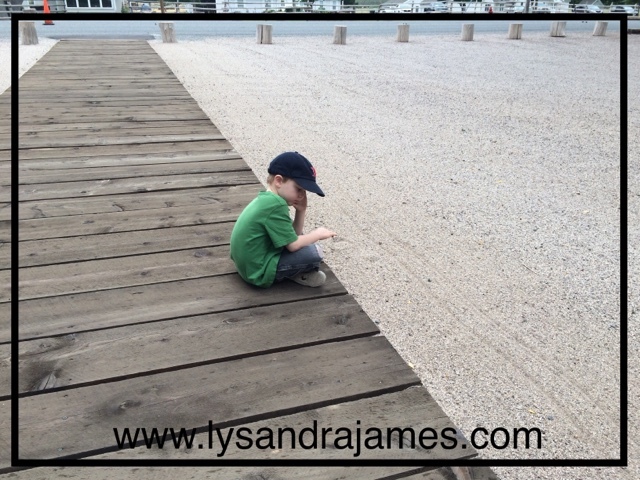 On the flip side, negative beliefs are evidenced by our actions as well. If you believe you're worthless, you hide yourself away and lose yourself in meaningless activities. If you believe you have no talents, you don't seek to try new things. If you believe you're alone, you don't reach out to others when things go wrong. Believing in something doesn't just happen. You don't wake up one morning suddenly believing. You must choose to believe. Choose to believe you are worth the effort. Get up, get dressed, and get out of the house. Stand tall and look others in the eye. Discover what is great about who you are. Choose to believe in something greater than yourself. If you're not inclined to believe in God, find something else to believe in - science, the greater good, whatever feels right. Seek out information through books, blogs, or talking to others. Learn everything you can and put what you learn to use. Choose to believe in your dreams. Take steps to make your dreams happen. 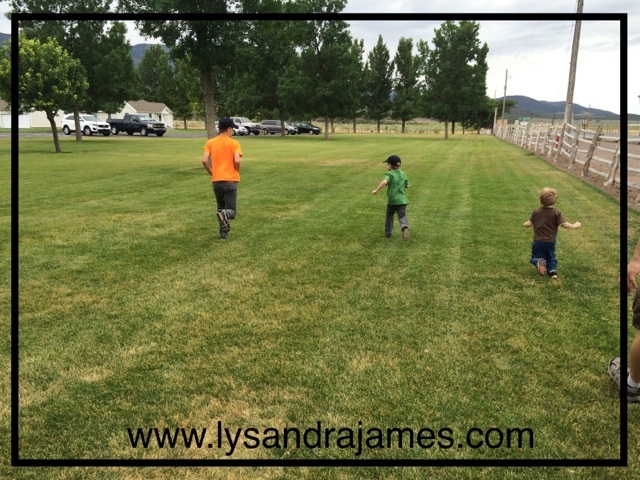 They can be baby steps or even a slow shuffle, but always move forward. Belief takes time. Just as the smallest seed only grows when watered and cared for, so does your belief. There will be days when you will be challenged - days where you want nothing more than to hide under the covers and wait for the storm to pass. But don't give up. If you want to believe, truly believe, then act. Move forward. Do what it takes. You can do it.